The Magpie Cap has eyelet lines that go off in different directions. Started at the top, it is worked to the size you want at the gauge you want, and finished with a rolled edge. The adult - medium hat pictured took 120 yards of worsted weight yarn; changing the size and gauge will affect the amount of yarn used. 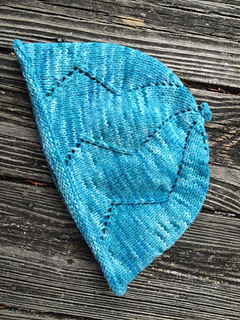 A fast and fun knit, this hat makes a great gift item.